A new dinosaur unearthed in Wyoming had such large teeth that its mouth perpetually looked to be smiling a huge grin. 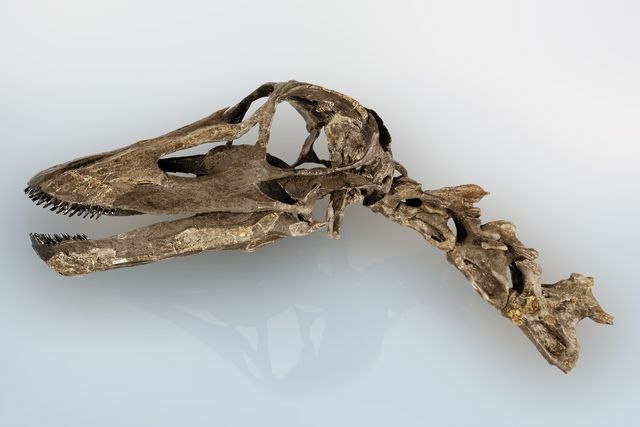 The dinosaur, described in the latest Journal of Systematic Paleontology, is called Kaatedocus siberi, with its name deriving from Diplodocus and the Native American Crow word for "small." Diplodocus was yet another dinosaur with a winning smile. This latest find was an early ancestor to that dino. "Kaatedocus walked on four limbs, had a long neck and a whiplash tail, such as the famous Diplodocus did," co-author Octavio Mateus told Discovery News. Mateus, of the Universidade Nova de Lisboa Museu da Lourinh, is one of the world's leading paleontologists, and is particularly known for his work on sauropods -- iconic large, plant-eating dinosaurs with long necks and tails. He has studied sauropods on four continents. Kaatedocus was one such dino. Its herbivorous diet helps to explain its "grin." "Kaatedocus had a set of pencil-like teeth in the front part of the muzzle," Mateus explained. "They were adapted for eating plants. As for many sauropods, because those teeth were not adapted for chewing, Kaatedocus probably ingested gastroliths or gizzard stones." Mateus and an international team studied the well-preserved remains of Kaatedocus. Often quite a bit of artistic license is needed during reconstructions, but in this case, even the skull makes evident the dinosaur's "smiling" appearance. Kaatedocus lived 150 million years ago, during the Late Jurassic period. A relative of Diplodocus, this dinosaur lived earlier and was smaller. The vast majority of species from this dino family come from the Jurassic Morrison Formation of the Western United States. In contrast, this new dinosaur was found further north, suggesting that subsequent generations slowly moved southward over time. In addition to the smiling expressions, this family of dinosaurs holds another memorable distinction: they apparently weren't too bright. Ke-Qin Gao, a researcher at Peking University's School of Earth and Space Sciences, and colleagues reconstructed basic features of dinosaur brains based on endocraniums, or the inside surfaces of dino skulls, if these features survived in the fossil record. Gao and his team used an Encephalization Quotient, or EQ, to speculate upon the complexity, or lack thereof, of brain activity in dinosaurs. The EQ is a ratio of brain mass to body size. At the very bottom of the EQ ratings is Diplodocus, with a meager .05 EQ. One of the longest known dinosaurs, Diplodocus could measure around 90 feet in length. Twenty feet of that was neck, topped off with a tiny head and an even tinier brain case. Its long tail could inflict some serious damage to predators, though, as could a kick from one of its four sturdy legs. Kaatedocus likely had a similar EQ, but it managed to survive in an environment with a lot of other formidable dinosaurs. According to Mateus, these included Barosaurus, Stegosaurus and large carnivorous Allosaurus. In terms of the recent Wyoming discovery, Mateus said, "This species is smaller and slightly older than other dinosaurs of the same family, it is important for understanding the evolution of all Diplodocus-like dinosaurs." Dino buffs can see the remains of Kaatedocus. They currently are on display at the Museum of Jurassic Aathal in Switzerland.